EPA records shed new light on a controversial episode during former Administrator Scott Pruitt's tenure — a search for surveillance devices in his headquarters office. Soon after Pruitt was confirmed to lead the agency, an exchange of emails in February 2017 shows how the request was made for the bug sweep and how an outside contractor was found to complete the task. "One of my agents has been informed that the Administrator would like his office swept for bugs, listening devices," wrote an EPA special agent-in-charge of the Protective Service Detail, which provides security for the administrator, in an email. Pasquale "Nino" Perrotta, another EPA agent who served on the detail and was later picked to lead it, was identified as someone who could help. He would write at one point in an email that he knew "someone that is cleared for such activities." Perrotta later shared contact information for Edwin Steinmetz and checked up that he would be allowed in to perform the work. "If all Is acceptable, Mr. Edwin Steinmetz will be here Friday morning," Perrotta said an email to EPA officials. Steinmetz's business, Edwin Steinmetz Associates LLC, was paid $3,000 for a "Sweep for covert/illegal surveillance devices." The move, however, to bring in the security expert sparked concerns within EPA. "Between you and me — this [is] not all good at all," wrote Reginald Allen, then assistant deputy chief of staff at EPA, in an email to Chief of Staff Ryan Jackson almost two weeks after the sweep was conducted. He said Michelle Hale, then Pruitt's executive assistant, and the security detail should not have been involved in contracting the bug sweep. "Michelle and PSD can't do that because they don't know the rules or the touch points to get thing[s] done properly in many cases," Allen wrote. "For example the vendor used was not certified by the US Gov't to do this kind of sensitive work, he was not vetted by Homeland Security, there happens to be a federal procedure for this type of action that was not followed, the purchase was never approved causing a whole set of issues, and on and on," he said. Perrotta would email Allen saying the bug sweep request came from the administrator's office. He noted that similar requests had been made by prior EPA chiefs and he had provided a vendor to Pruitt's assistant to help with this sweep. Allen later memorialized EPA's process behind the sweep in a memo dated April 3, 2017. He noted Perrotta with other EPA officials had arranged for the work to be done but a purchase request for the sweep had not been submitted. "While this miscommunication could have been avoided with better communication, I assess that this purchase is a permissible use of appropriated funds, and a necessary expense of carrying out agency functions in a safe and secure manner," Allen wrote. "This is particular true due to the time between sweeps — over seven years," he said. Allen, who is said to have raised concerns about Pruitt's spending and travel demands, is now on a one-year detail to George Mason University (Greenwire, April 13). Pruitt having his office swept for bugs became another instance of his penchant for security at the agency. He often flew first class due to security concerns, a secure phone booth was installed in his office, and he had guards on duty around the clock, costing EPA roughly $3.5 million in travel and payroll costs for the detail during his first year in office. The EPA inspector general would later find that the agency failed to justify Pruitt's increased security spending, which EPA has disputed. Pruitt resigned from EPA in July after battling allegations of heavy spending and mismanagement. When contacted by E&E News for this story, an EPA spokesman referred to a prior agency statement when the bug sweep was first reported on last year (Greenwire, Dec. 19, 2017). Then-EPA spokesman Jahan Wilcox said, "Administrator Pruitt has received an unprecedented amount of threats against him and security decisions are made by EPA's Protective Service Detail." Wilcox also noted then, "A similar security sweep was done for EPA Administrator Lisa Jackson." Liberal-leaning watchdog group American Oversight won release of the EPA documents through Freedom of Information Act litigation, which then shared them with E&E News. "Three months after Scott Pruitt left the EPA in disgrace, we're still finding new evidence of his self-serving approach to running the agency: spend taxpayer money first, ask for approval later — or never," Austin Evers, executive director of the group, said in a statement. "Through his own actions, President Trump has sent a clear message that public officials are free to use their offices for personal gain, and from Pruitt to former HHS Secretary Tom Price, to FEMA Administrator Brock Long, this is a pattern we're seeing over and over across the administration," Evers said. Congressional Democrats in various letters have raised questions about Pruitt's bug sweep. The role of Perrotta, who retired from EPA earlier this year as scrutiny of Pruitt's security intensified, in the contract has come under questioning, with lawmakers noting that Perrotta worked at a firm outside of EPA, Sequoia Security Group Inc., where Steinmetz was also an executive. Perrotta told E&E News in an interview today that he tried to find other contractors to do the sweep. After receiving a request from the administrator's office, Perrotta said that he and other security agents made calls to various offices around EPA to find a vendor who in the past conducted a security sweep of the administrator's office. "Nobody had information on the prior vendors," Perrotta said. "I made a recommendation of Steinmetz." Perrotta said Steinmetz's firm that performed the sweep was separate from his own company. "Edwin Steinmetz has his own business that he has had for years," Perrotta said. "I don't understand how Steinmetz and Associates got linked to Sequoia Security Group. People said I swayed a contract to Sequoia Security Group. Sequoia Security Group did not get the contract." Steinmetz also told E&E News, "Nothing was done here that was inappropriate. "Sequoia didn't get a penny from it. I got a call that said, 'We need this yesterday. Can you do it?'" he said. Asked about Allen's contention that he was not certified, Steinmetz said he was capable of doing the work. "It's interesting that I'm not qualified. I have done work for seven federal agencies. I sweep SCIFs," he said, referring to a Sensitive Compartmented Information Facility, a secure room used by government officials for communications. "There is a reason that these people reach out to me." Perrotta added, "If you asked me today to recommend somebody, I would recommend him again," referring to Steinmetz. "He is qualified. He does work for the government through his own business," Perrotta said. 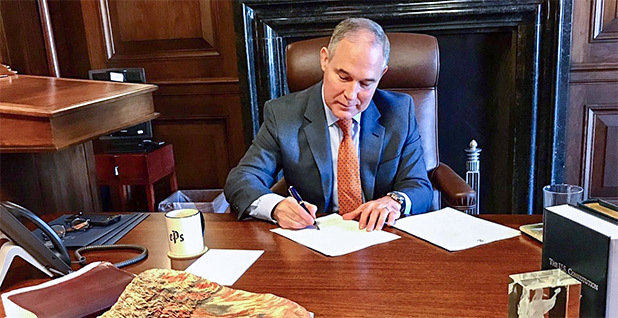 Click here to read the EPA records on the bug sweep of Pruitt's office.